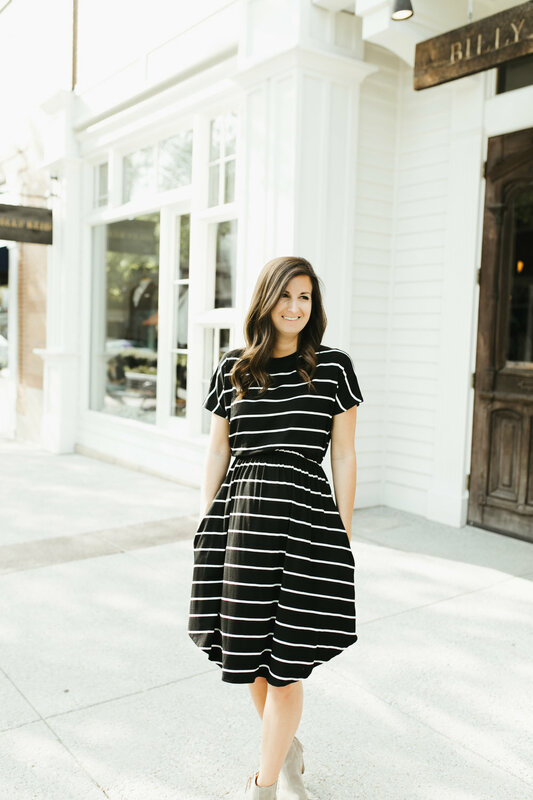 Y’all know how much I love a good striped anything; and these days, I could live in this striped dress from VICI. Not only does it fit my growing bump (which is a very big deal), it is also incredibly comfortable. It’s the perfect length for work but can also be dressed up for a night out with the girls. Regardless of the size of my bump, this dress will be a go-to for a long time to come. I will never give up on a good striped outfit. I try very hard to live a life like Jesus. But, as you might expect, it is not easy. I constantly find myself coming up short. This is especially true when I feel like I have been hurt by someone else. We all know the feeling of being completely let down. It’s a feeling I wouldn’t want anyone to experience. But it’s going to happen – even when we are convinced we did everything right. We are still going to be let down. When someone brings you that kind of hurt, it is very easy to walk away. You are totally justified to be upset and cut them off. But is that what you are supposed to do? I have struggled with this situation a time or two. And I’d be lying if I said there weren’t times when I was in the wrong (okay, a lot of times). But, hey, I am not perfect by any stretch of the imagination. I struggle with the “now what” part that comes after a heart is broken. I don’t like to just give up on someone. It isn’t in my nature to walk away and not fight for a relationship. But what I am learning isn’t to give up… it’s just to take a step back. Taking a step back for time to heal and process for both parties is sometimes all you can do. This doesn’t mean you are giving up. It means you are making a healthy choice for YOU. Which can, in turn, allow you to forgive in the way Jesus might need you to forgive. It is beyond important to recognize the difference in giving up and stepping aside. God doesn’t walk away from us. He doesn’t even take a step back. But He shapes our lives in a way that allows us to see what we really need. And sometimes what we need is some space – a moment to heal and catch our breath. He knows when we need it, which is always long before we realize it ourselves. When it is time—when we can truly forgive and be ready to listen—He will direct us back where we need to go. Trusting Him in our current situation is what we need to focus on more than anything. What situation do you need to take a step back from today? Where do you need to trust God? Who do you need to forgive? Whatever you are looking for, I pray that you are able to trust in God’s direction and timing.